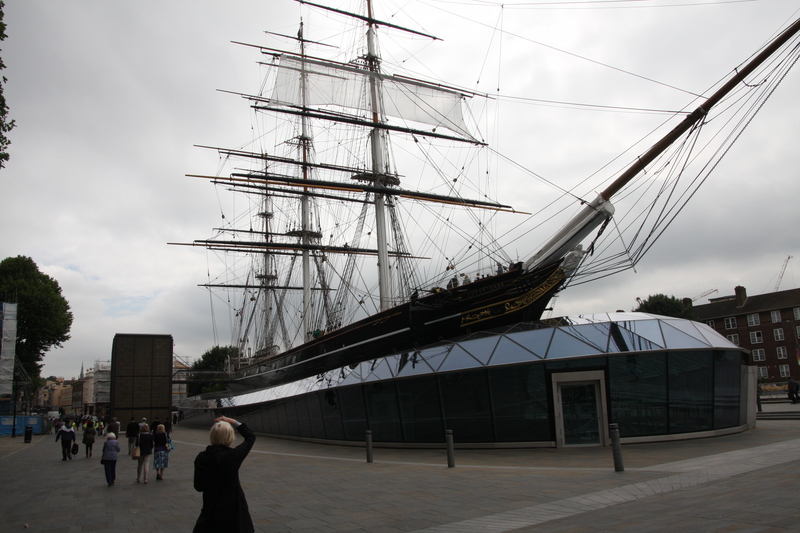 27 members and friends of Oxdfas visited Greenwich, home of the Cutty Sark, the Maritime Museum, the Royal Naval College and everything historical with a naval background. The group saw the largest ‘ship In a bottle’ measuring many metres long and containing a replica of Nelson’s Victory. The Museum was packed with naval memorabilia including a memorial to engineers on the Titanic, maps, original oil paintings, artefacts and a fantastic luxurious 18th century barge belonging to Prince Frederick. The guides took the group through the Museum highlighting key items of interest and answering many questions relating to Nelson and his battles. 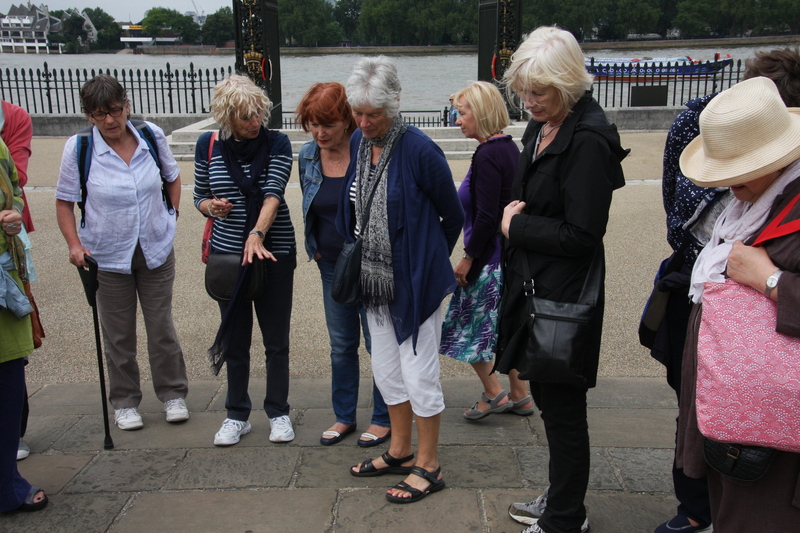 Moving on to the vast 18th century buildings of the Royal Naval College, the group were shown inside the Painted Hall and the chapel as part of the tour. Some Members also visited the Fan Museum for lunch and a tour. 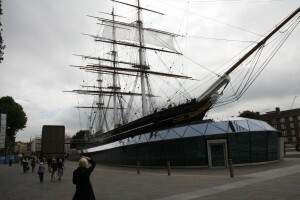 Others visited the Royal Observatory and the Cutty Sark. Clearly there is too much to be seen in Greenwich in just one day. 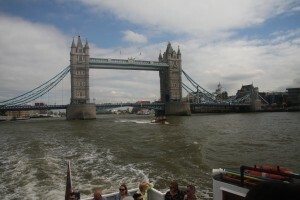 The day concluded with a relaxing Thames river trip by boat from Greenwich to Westminster pier with a guide highlighting the key buildings and their history. Juliet Blackburn organised the trip and fixed the weather too, which was good. Bologna, Ravenna, Mantova, Urbino, and Ferrara, can you really do five Renaissance cities in six days? How we managed to do all of Polly and Josephine’s ambitious programme I really don’t know, but we did, and we managed to squeeze in delightful lunches, wonderful ice creams, evening strolls and quite a lot of prosecco on the roof top terrace of our perfectly situated hotel. They call Bologna the Fat City because of their love of dairy, pig and pasta so you don’t come to get thin, but it is also a Unesco listed Medieval city so you burn off those delicious calories walking through kilometres of porticoed streets. The sun shone from the moment we landed and we basked in temperatures from 28 to 38 degrees every single day. The sun bathed red-gold plain brick Renaissance exteriors gave way to glittering interiors of astonishing beauty and great craftsmanship. All five cities were gems, each with its own unique treasures, but perhaps Ravenna’s mosaics most captured the essence of the trip. Art, devotion, power, imagination, craftsmanship, politics, all came together in chips of stone and glass; it was sensational. An Oxdfas trip is not only about wonderful places, when you go with Oxdfas you go with friends, there is always someone to point out where you are beginning to burn in the sun, to share a table with, to laugh with, to make sure you are on the coach, to tell you where the best ice cream is to be found, or to share the wide and diverse knowledge our Oxdfas possesses. The guides were excellent but it really added to the trip having such a wealth of knowledge in our own group, we had Dr’s in the anatomy museum, historians in the streets and painters in the Pinacoteca. Thank you all for sharing. This was Polly’s swan song and she will be much missed, she lead with great brio, first up and last to bed. We are very lucky to have those talents in Oxdfas so can I close by acknowledging the debt to Polly and Josephine for delivering a first class experience. Your fellow travellers salute you. A group of us had the privilege of being guided around the Oxford University Natural History Museum by Alison Porter, who as you know serves on the Nadfas committee, but also, amongst her other skills and talents, is an official guide to the museum. The tour for members of the public lasts only 25 minutes but she spent an hour telling the story of this iconic building in a most interesting way. We must all have taken friends, children and grandchildren to visit it, so it is familiar, but a new side of it was opened up, things we may never have noticed. Did we know that the funding, £30,000, came from the sale of bibles to Americans in the Mid-West? The fact that the budget was overspent did not surprise us. But did we know, or had we noticed, that as a result only some of the window surrounds on the front façade had been carved? Most people did know about the Wilberforce-Huxley Evolution Debate which had taken place in 1860, the year when the museum was opened. Having started the morning with a good cup of coffee at the café on the first floor, from this vantage point we started to look more closely at the architecture and decoration. 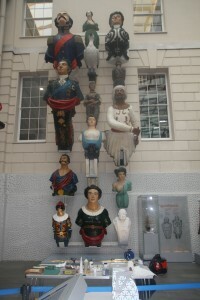 We started by looking at the collection made by William Buckland and his role in teaching science at the university and went on to hear of the role Henry Acland played in the building of the museum, why a Gothic style had been chosen as opposed to the classical style chosen for the Ashmolean and the part played by John Ruskin not only in the choice of architecture but also in the detailed design work, reflecting the Pre Raphaelite movement. In the course of this we had an interesting discussion about the use of Caen stone. We all very much appreciated the interesting way in which Alison told the story with many intriguing anecdotes, including mentions of a giraffe, a coffin and a pickled heart! Richard, who is one of our members, gave the latest of our Get to Know… sessions. Fifteen of us went to his home where he explained the craft of wood turning and showed us slides to illustrate what he said. Richard started with a plank of wood, often ash, and went through the stages of transforming it into a dish, a bowl, salad servers, a paper weight etc..
At the end of the talk, Richard passed around some of the lovely objects that he has made and explained some of the techniques, especially inlay, in which he is particularly interested at present. The beauty lay not only in the shape but also in the use of the grain of the wood, and the inlays. They have a very tactile quality and I noticed we all wanted to stroke the wood! Richard then took us down the garden to his workshop and showed us his lathe and the tools he uses. He even gave a little demonstration. In the Get to Know… sessions we usually meet for coffee before we start the talk. It was very kind of Kathy and Richard to offer us all coffee and Flapjacks – much appreciated. So, a big ‘thank you’ to Richard (and Kathy) for this most enjoyable morning. Oh dear, the bar is being set ever higher – people will soon become frightened to offer to lead a session. But please don’t be deterred and let me know if you have something you could show us, or tell us about. On an extremely wet Thursday in the early afternoon a group of us gathered in our cars outside the cricket pavilion, having negotiated the strict security at the entrance gate and driven for over a mile through woods and past almost manicured fields to our destination. The original plan was for the group to split, half to the walled garden first and half to the library but owing to the inclement weather there was not much enthusiasm for the garden so with the kind permission of the assistant librarian Bick Keat we all walked through yet another security gate to the library built by Sir Paul Getty after he acquired the estate in 1984, and housed in a flint mock four-square battlemented fort behind the main house. Inside there was nothing pseudo about the library nor about its wonderful contents. Brian Maggs, the well known book seller who is in charge of the collection, gave us an introduction to it and to the rationale behind its makeup. The theme is The Art of the Book, art in the form of fabulous bindings, printing, illuminations, atlases, manuscripts; for all of them Sir Paul bought the best so what we saw among the many examples laid out for us to consider and admire could not be bettered. 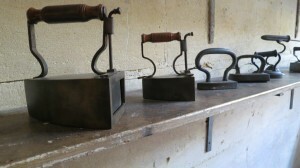 Bindings and printings ranged from the very early, both British and foreign, to those of the 21st century. There was a first folio Shakespeare, Chaucer’s Canterbury Tales, the first map of Ireland, Anne Boleyn’s psalter, one of Humphrey Repton’s Red Books, a small prayer book with lettering woven on silk pages, some oddities like backless books, a triangular Masonic rule book and a small missal, inside of which was an 18th century miniature gun, fired by pulling on the tassel. Early James Bond! The librarians were extremely kind and attentive, more than willing to explain and to handle items where we wished to have a closer look. At the end of the library visit, many elected not to drive to the walled garden but to depart; a few hardy souls decided that, even in the rain, we could not turn down the opportunity of seeing a 2 acre walled garden, originally of around 1780, which having fallen into disuse was restored by Sir Paul in the early 1990s, and designed by Penelope Hobhouse, using the footprint of the original. Having winkled the gardener, Roger, out of his greenhouses, where he was wisely sheltering from the elements, he gave us a short introductory talk on the plan of the garden – a central cruciform brick path, four quarters comprising vegetables and cut flowers; croquet lawn and wild flowers; herbaceous; and rose garden with a green theatre, all surrounded by buttressed yew hedges. This garden, plus the house garden, another on the estate and that by the Garsington opera buildings is managed by just four full timers with a little part time help. All was immaculate. Several of us came away feeling “we must do better” but with ideas from the sensitive plant and colour groupings, especially in the herbaceous beds. In all, a most informative and enjoyable afternoon. 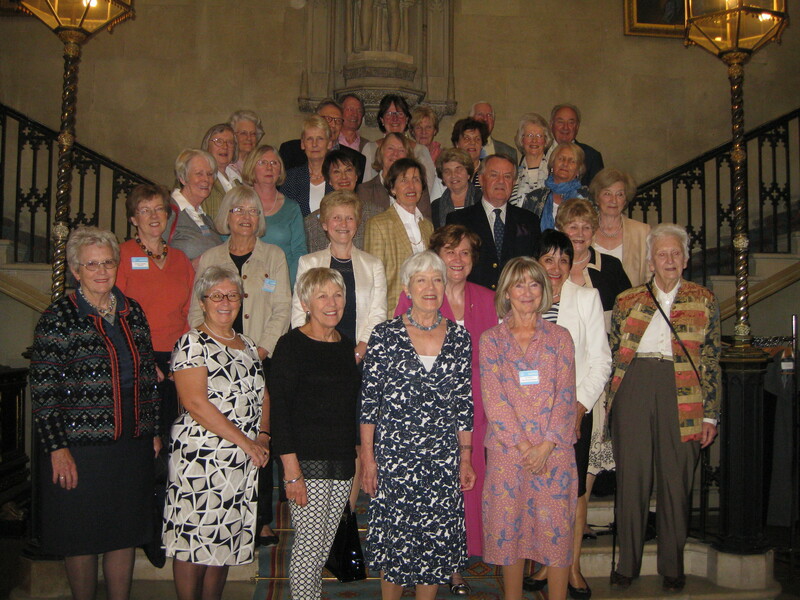 On Friday, April 10th 2015, our South Mercia Area Chairman, Dory Thompson, invited local Society Chairmen and Secretaries to Ashridge House near Berkhampstead for a tour of the house followed by tea. Ashridge House has an interesting history, some kind of dwelling having been on the site since the Middle Ages, starting with a monastery, the 200 ft deep well of which can still be seen. The present house dates back to the middle 19th century and is a fine example of grandiose Victorian Gothic revival, complete with large chapel. It is now a Management Training Centre. Our founder Chairman, Pat Dugdale, can be seen on the extreme right hand side, three rows back, our Secretary, Liz Rhodes, can be seen in the fourth row, extreme left hand side and your current Chairman, Kate Lack, can just about be seen mid back row. We all had a very enjoyable time. Thirty-one of us boarded a coach at the crack of dawn, having endured Oxfordshire’s current traffic hold-ups. 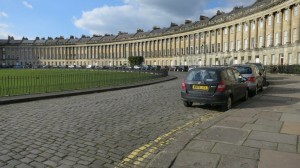 We were bound for the American Museum, housed in Claverton Manor, just outside the centre of Bath. I for one, had no idea such a place existed, and certainly not in an old English manor house, but great delights awaited. The house itself was gracious, and set in a beautiful landscape, which would have repaid exploration by itself. We were divided into small groups and given an hour-long guided tour of the museum, by enthusiastic and knowledgable volunteers. The place was a revelation; each room was separately themed, and furnished and decorated with authentic American artefacts, sourced from the USA itself. The furnishings and decor reflected the tastes of the time, from the early European settlers to the 20th Century. 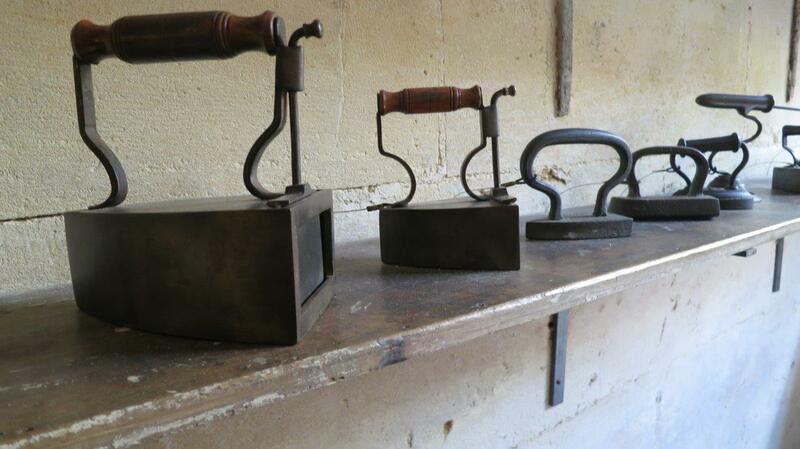 We saw beautiful English and French furniture and wall coverings, all painstakingly transferred from the States, and a fascinating display of Shaker work. A display of lovely embroidered quilts was especially popular, as was a large section devoted to native American culture.One of the most intriguing objects was a beautiful embroidered dress, which had been worn at a ball to celebrate the end of the War of Independence, and then, 100 years later, restored to be worn again at the end of the Civil War. We ate a most delicious lunch in the orangery, with authentic American dishes. I’ve not eaten that well in America itself! 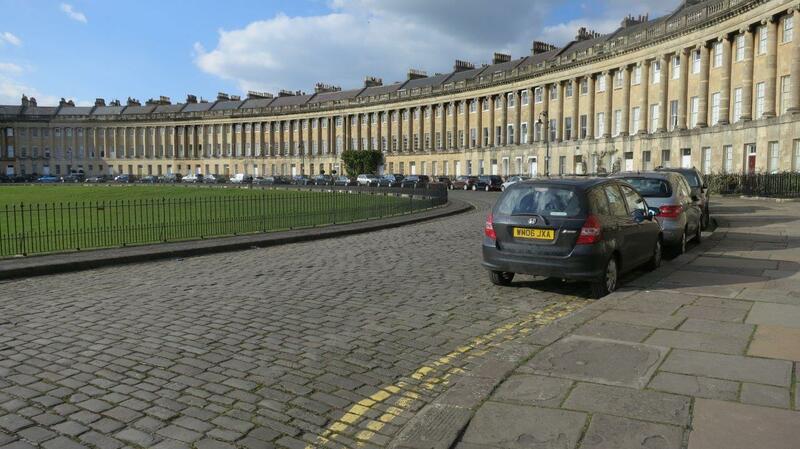 And then on to no.1 Royal Crescent, now a museum and newly restored, and though less surprising, equally fascinating, as a peek into Georgian history. It was a lovely day, so some of us included a walk round the terrace itself, and then home on the 4.15 coach, narrowly avoiding the rush hour. Sincere thanks to Trish Mather for a truly memorable trip. Clare Pollard, the Curator of Japanese Art, showed us some of the museum’s collection of prints by Hiroshige and Hokusai and as the visit coincided with an exhibition of Hiroshige’s landscapes, she also guided us around the gallery displaying his works. I am sure I am not alone in saying that my understanding and appreciation was increased greatly by the benefit of Clare’s expertise, not least by the way she drew our attention to details we might have missed when looking at these, sometimes amusing depictions of life along the Tokaido Road. Mark Norman, Head of Conservation, oversaw our visit to his department with some going to the Main Conservation Studios and others to Paper Conservation. It would be impossible to come away without being fascinated by the time, effort and devotion that his small team dedicates to preparing exhibits for display and conserving treasures for future generations. 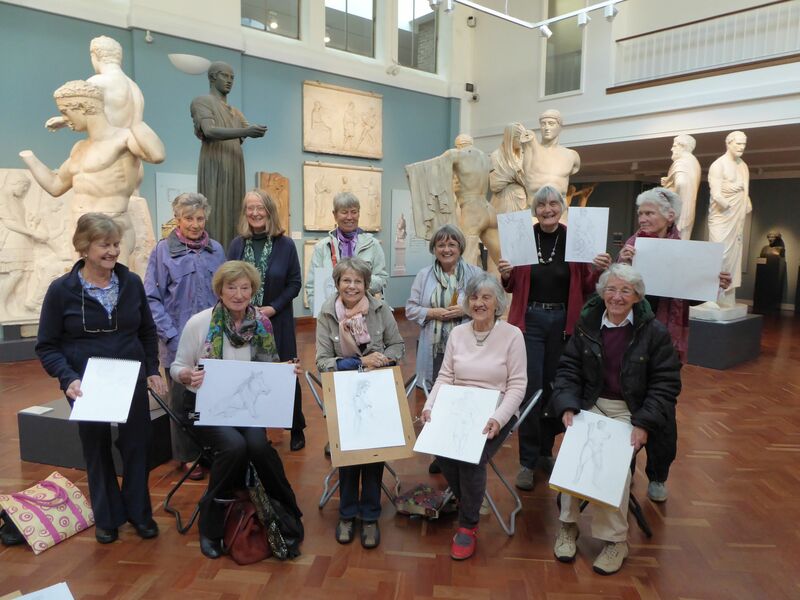 In the latest Get to Know … session Mari Burns gave us a wonderful introduction to Dutch Still Life paintings. She very kindly gave her talk twice, on the 12th and 13th February, so more of us could benefit. Her talk started with the early flower paintings. These were made at a time when beautiful and exotic imports could be purchased more cheaply as paintings than as real flowers. Mari then showed us the Vanitas paintings where we learnt that almost every item had a symbolic meaning. She ended by looking at the later beautiful compositions which incorporated many favourite objects. Mari explored this wide range, inspiring us as she did so with her own enthusiasm. I’m sure I shall not be the only person returning to look at these fascinating paintings again and appreciating them more fully. The talk was excellent and I was so absorbed I completely forgot to try and take a photo! Our latest Get to Know… session was to Exeter College. After a pleasant cup of coffee at the Vaults Café, we walked to the College where Allan Taylor had arranged for us to visit the William Morris Room. Allan started by saying that, as a former college bursar and now our Society’s treasurer, he felt ‘out of his comfort zone’ in talking to us. This didn’t show in the least as he proceeded to give us a fascinating talk about Morris. I had no idea how versatile Morris was. Most of us knew of his design work but I certainly didn’t know that he was an accomplished poet. Olga Gold read a fine poem he had written. Morris had been a student at Exeter at the same time as Burne Jones and they formed not only a lasting friendship but also collaborated on many projects together. The room had examples of Morris’ textiles, of his prints and several delightful drawings by Burne Jones. This room is not open to the public and so was a rare treat. Allan then took us across to the chapel to see the tapestry designed and made by Morris and Burne Jones. He explained how the background had been altered from the early drawings as a bare hillside was replaced by a forest scene. It was a wonderful opportunity to look at some of the details such as the huge variety of flowers and birds. Another treat was to visit the library where we were able to see some letters and other memorabilia from Morris. We were all very impressed by the depth of Allan’s knowledge. Clearly, helping at Kelmscott, Morris’ house, has strengthened Allan’s enthusiasm and respect for the work of William Morris. We were the happy beneficiaries of this. The latest Get to Know… was rather different from anything we have done before. 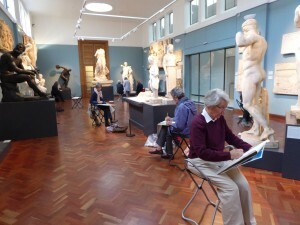 This time, Sandie Redman, one of our members, took us to The Cast Gallery in the Ashmolean for a sketching session. She explained some of the basic principles and then got participants to do two quick sketches before embarking on a more detailed one. Sandie walked around offering advice and support. Her skills as a teacher were very apparent. One lady commented ‘Sandie always managed to find something complimentary and encouraging to say’. 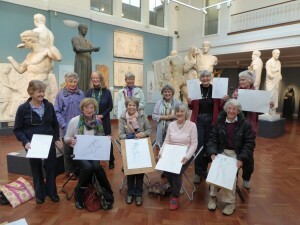 Some of those taking part hadn’t drawn since they were children whereas others were clearly much more experienced. Everyone gained from the session. One of the non-drawers said to me at the end ‘It has made me look at the objects with an attention that I have never done before. I feel exhausted!’ That is a skill she can now use whenever she is in a gallery whether she is drawing or not. Many thanks to Sandie for suggesting the original idea and for arranging it all with the museum. 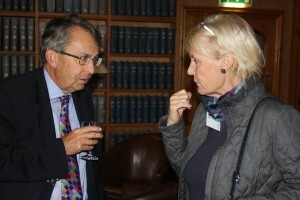 Around 50 members and guests enjoyed a visit to the Oxford Union. Librarian Sue Lockley gave a fascinating talk about the history of the building and the Pre-Raphaelite murals. 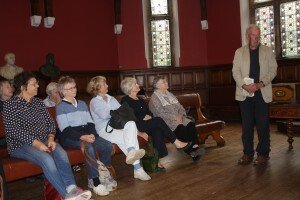 Alastair Lack gave an excellent and humorous presentation on the history of the debating chamber since his days at the University, and more recent events. Alastair explained the formalities, gave some personal anecdotes and talked about the many internationally famous personalities who had debated there. He also talked about the statues around the Chamber. The visit was rounded off with a glass of wine and a social hour, during which many new friends were made among the group. Twenty Five us enjoyed a most interesting visit to the Northamptonshire home and estate of the Duke of Buccleuch, Boughton House. This was a private visit as the house is only open to the general public in August. On our arrival we were greeted warmly by the estate manager and then served coffee and homemade biscuits. This was followed by an excellent guided tour of this most interesting house, which has a range of treasures, including paintings by El Greco, Van Dyck and Gainsborough, Mortlake tapestries, porcelain, rare furniture, weaponry and textiles. We also saw an en-suite bedroom slept in by Churchill and Princess Margaret but were reassured their visits did not take place at the same time! After the tour we had lunch in the Old Stables, which had been prepared from home grown produce, by two friendly locals who could not have been more attentive to our party. 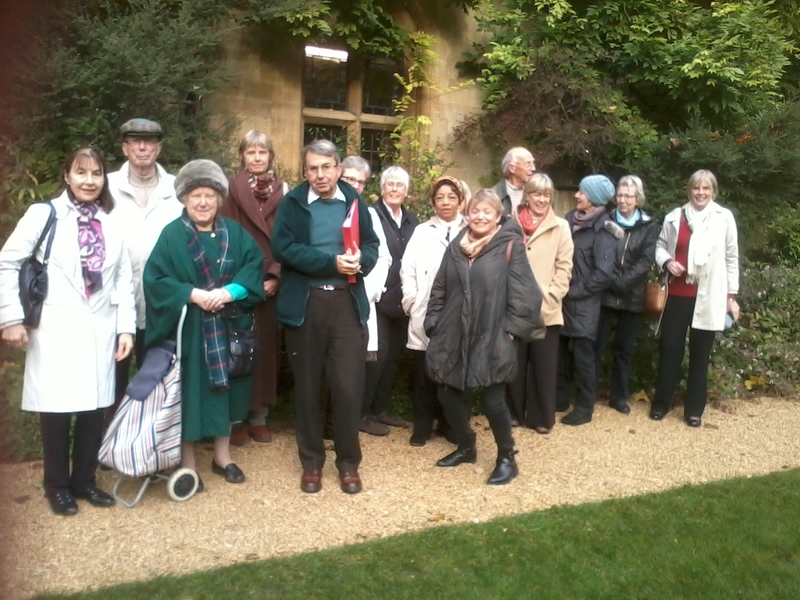 In the afternoon we got back onto our coach for a guided tour of three of the picturesque estate villages: Warkton, Weekley and Geddington. The church at Warkton contains magnificent monuments to the Montagu family, from whom the Buccleuchs are descended. These memorials, some made from Carrara marble and which would look at home in a cathedral were in the process of being restored so we had the added pleasure of a talking to the restorer, who interrupted his work to answer our questions. The village of Geddington is one of the places where Eleanor of Castile’s body rested on the journey south before being entombed in Westminster Abbey. At each resting place her husband, Edward 1, arranged for a stone cross to be built in her memory. Geddington has one of the finest and one of only three that survive intact. On our return to Boughton House we were served an array of delicious homemade cakes by the hospitable catering staff and had enough time to visit the shop before departing for our return to Oxford. Our thanks go to Kathryn Hopkins for her excellent organisation of this visit.